Sealaska Heritage Institute (SHI) is one of 64 organizations in the nation to be approved for an arts award given by the National Endowment for the Arts Our Town program. The awards, which total $4.3 million, support creative placemaking projects that help to transform communities into lively, beautiful, and resilient places with the arts at their core. SHI plans to use some of the $100,000 award to hire master artists to teach Native art classes for prison inmates in Juneau. The goal is to connect potentially vulnerable tribal members to their culture, help them transition from incarceration to release and to provide skills that will help supplement their income, said SHI President Rosita Worl. “We’ve found that once our tribal members are released from correctional centers, they struggle to adapt to life outside and sometimes wind up back in prison. 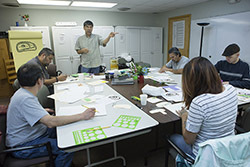 We are aiming to turn that around by connecting them to their Native culture and teaching them a marketable skill, said Worl, adding the project builds on formline and carving workshops that SHI has sponsored in recent years at Juneau’s prison and halfway house. SHI also will sponsor Native art classes for low income individuals living in subsidized housing through a partnership with the Tlingit and Haida Regional Housing Authority. In addition, all participants will receive business training for artists. The institute anticipates that participants who learn to make Native art may eventually sell through the Sealaska Heritage Store, which SHI opened in 2015 in the new Walter Soboleff Building. Through the store, SHI sells Native art, crafts and keepsakes to residents and the near 1,000,000 tourists who visit the community each year. Proceeds from sales are reinvested into art programs operated by Sealaska Heritage. In addition to the housing authority, SHI is partnering with Sealaska, which is supplying wood for workshops and practice, the Alaska State Council on the Arts and the Lemon Creek Correctional Center. The project also is supported by the Juneau Arts and Humanities Council, the City and Borough of Juneau and the Juneau Re-entry Coalition.